As the movies began to become more and more important in Doris Day's entertainment legacy, single records became less and less important, and concept albums more important. This is especially true of her earlier albums because they were a collection of the songs sung in the various films. (See our "Albums" page in the navigation menu). That said, the early 50's were certainly high profile years for single Doris hits including some of the biggest sellers of her entire career (a few of which are pictured above). 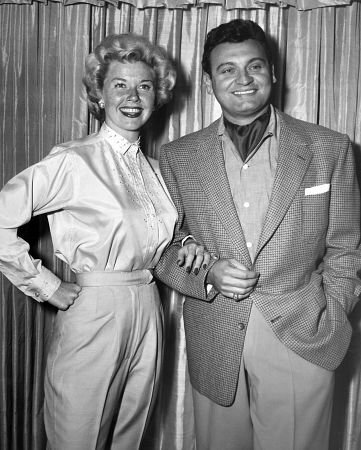 Doris had 9 charting single hits in 1951, two of which hit the Top Ten. One was a novelty tune called "(Why Did I Tell You I Was Going to) Shanghai?" There was also a double-sided monster jukebox hit which she recorded with Harry James and His Orchestra. The "A" side was a Latin flavored love song called "Would I Love You (Love You, Love You) which peaked at #10 on the singles charts. 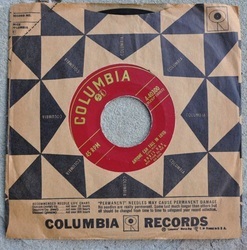 Side "B" was an uptempo jazz recording of "Lullaby of Broadway". It reached the Top 20 on the charts but remained on many jukeboxes throughout the entire year. A majority of music critics still say it is the best blend of band and vocalist ever recorded. It is a plus plus on all counts. Other Top 40 hits for Doris in 1951 included: "Ask Me", "Lonesome and Sorry", "Till We Meet Again" (which features a duet with an unannounced singer that most think is Gordon MacRae or Jack Smith), both of whom were in the movie from which it comes, On Moonlight Bay, "It's A Lovely Day Today", "Domino" and "My Life's Desire" (everything from a march to a polka to a French flavored song to a ballad). Click the audio player below to hear a sampling of these songs, which once again show the infinite variety in Doris' vocal style. 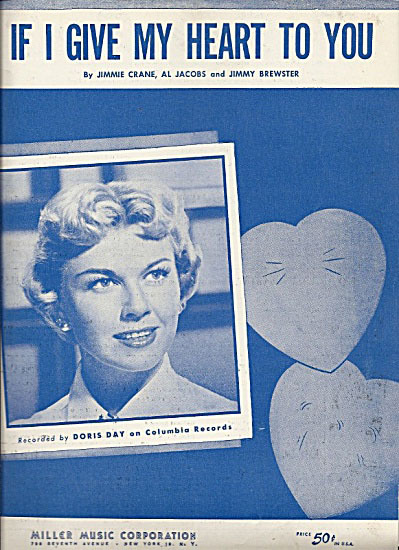 If 1951 was big for Doris on the singles charts, 1952 was more impressive because she doubled the number of times her records hit the charts: from 9 in 1951 to 18 in 1952, and two of these became major career marks: one a novelty song (again) and another beautiful ballad, both of which became signature songs for her. 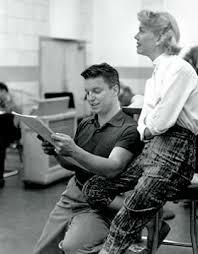 The most successful pairing was probably the one with Johnny Ray only because she recorded 4 songs with him. Two of them charted in 1952 and two of them hit the charts in 1953. In 1952 it was "A Full Time Job" and "Ma Says, Pa Says". In 1953, the songs were "Candy Lips" and "Let's Walk That Away". Other duets which hit the charts included: "A Little Kiss Good Night" and "Gently, Johnny" with Guy Mitchell, and "No Two People" with Donald O'Connor. 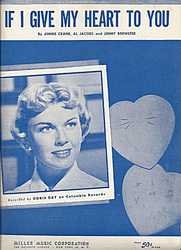 Doris also entertained us with four other Top 40 hits: "Baby Doll", "Oops", "The Cherries" and "My Love and Devotion". That was not all. These songs completed the hit records for 1952: "Who Who Who" (flip side of "A Guy is a Guy"), Take Me in Your Arms" (a hauntingly beautiful ballad), and "Your Mother and Mine" (from "Peter Pan"). With Donald O'Connor. The hit was "No Two People". The flip side was even better..."You Can't Lose Me". It is probably important to add that in 1952, Doris had her own radio show, which lasted for 2 years. That gave her a weekly opportunity to showcase her new recordings, both as a single artist, as well as a duet artist. Most of these duet partners appeared as guests on her show. Seven other songs by Doris kept us entertained in 1953, topped by a rousing tap dance song called "Mr. Tap Toe". It reached #10 on the charts. Close behind was another rousing rendition of an oldie, "When The Red Red Robin Comes Bob Bob Bobbin Along." Also popular was the title tune from another 1953 film starring Doris, "By The Light of the Silvery Moon". Two novelty songs were also big in 1953: one was called "Choo Choo Train", but the other became another signature song for Doris...it was called "A Purple Cow". The other two songs that rounded out the hit list for this year were "Kiss Me Again, Stranger" and "This Too Shall Pass Away" (click on audio player below). 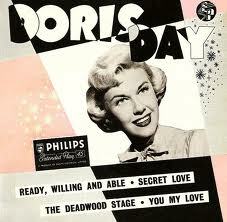 This was a truly successful year for Doris when it came to single record sales and jukebox/song sheet sales. The continuous flow from "Secret Love" (which began its chart ride in November of 1953) started out this year when it reached #1 in January. In fact, it did not reach its peak of sales until mid January and continued its popularity through April of 1954. It was still playing on radios and jukeboxes long into the next year and is still played today. In June, there was a little country type song by Doris that reached the Top 30 and charted for 5 weeks called "Someone Else's Roses". Its flip side is one of Doris' funniest songs done with a Latin American flavor called "Kay Muleta". In the Fall came Doris' next big record. It was a two-sided hit. 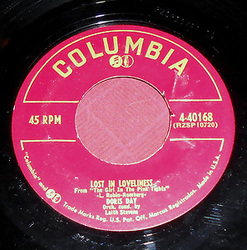 The "B" side featured a double vocal by Doris on a great song called "Anyone Can Fall in Love", which reached the Top 30. 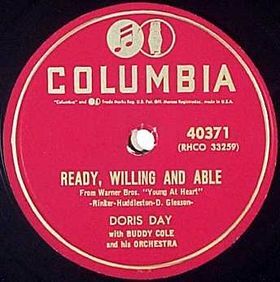 The "A" side became another signature song for Doris and is one of the most covered songs from the 50's. "If I Give My Heart To You" charted for 24 weeks (and continued its success into 1955.) Music critics have said that it, along with "Secret Love", are two of the most representative love songs of the 50's. 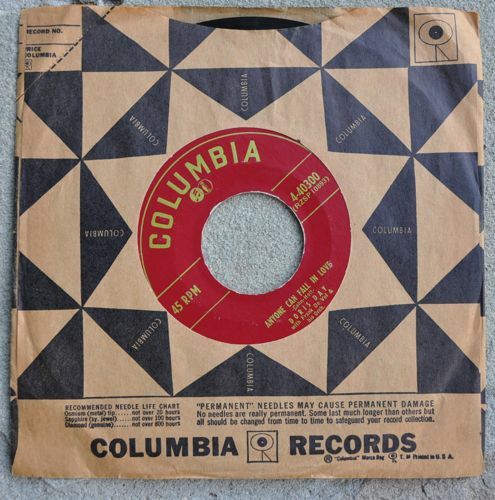 The Blue Bells of Broadway from "Lucky Me"
Everything revolved around this gigantic hit for Doris in 1955, both the movie, the soundtrack, and the singles. Those who know Doris and her story know that the movie, LOVE ME OR LEAVE ME, was a turning point in her career, dramatically and musically. The controversy continues to the present day: the fact debated so often has been that she was not nominated for an Academy Award for her part in this film when she should have actually WON the oscar. The role was a complete departure from her usual good girl, smiling face image from the past, and she won the top awards from all others that year (from LAFC to the Golden Globes). Beyond the dramatic impact of the film on her career, the soundtrack of music from that movie was another record setter. Not only was it the top selling album of 1955, but it is the longest selling album by any female vocalist in the entire 50's, and it still retains its place on the all time list of longest selling records by a female artist. And the songs? They were mostly old standards that had been associated with Ruth Etting (the subject of this biopic). Songs like "Mean To Me", "It All Depends on You", "Ten Cents A Dance", "Sam the Old Accordion Man". "You Made Me Love You", "Everybody Loves My Baby", "Shaking the Blues Away", "At Sundown", and the title tune flooded the air waves as disc jockeys continued to play various cuts from the album helping to increase its popularity ,and jukeboxes as well as sheet music sales helped to fire the boom. After her phenomenal successes in 1954 and 1955, Doris' contract with Columbia Records was up for renewal. There was no way they were going to let her leave the fold. She was offered and signed a million dollar contract for the next 5 years and became the most popular and highest paid female artist in music history to that point. There is a cute little story that goes along with the song that has become Doris' Super Signature Song, the song by which she is still known and remembered world wide. Alfred Hitchcock had it commissioned to use in the film, "The Man Who Knew Too Much". He knew what he was doing. He not only used it in the film, but it went on to win the Academy Award that year for the best song in a film, and it was richly deserved. It was an unusually good use of a song in a movie to further the plot. It has also been inducted into the Grammy Hall of Fame. At any rate, when Doris finished recording the song, as she was leaving the recording studio, she said, "well, that's the last time you'll ever hear that song". And the rest is music history! 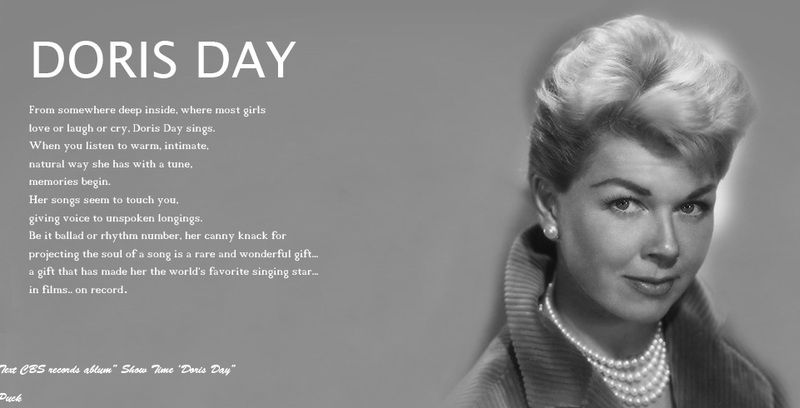 (She used it as the theme song for her five year long "Doris Day Show" on TV and also sang it briefly in two other films, and it became a major song in a future album release of songs sung with the Jimmy Joyce Children's Chorus). Because Que Sera was so popular, people have all but forgotten the flip side, which also charted briefly. Some deejays called it one of the best "torch"/"blues" songs ever recorded..."I've Gotta Sing Away These Blues". BUT THAT IS NOT ALL...There was another great song in 1956. It, too, was used in a Doris movie. It, too, was nominated for an Academy Award. It was a haunting ballad called "Julie", which reached the Top 40 in sales, helped along by its flip side, a tune from the Broadway Show,. "Lil' Abner" called "Love in a Home". Two other songs helped to round out the pop hits for Doris this year. One was another Broadway tune. This time the show was "Bells Are Ringing". The song is often used today as an end song for a compilation disc or even for a show. It is called "The Party's Over". The flip side was another attempt by Doris to compete in the world of rock and roll. It was called "Whad'ja Put in That Kiss?" 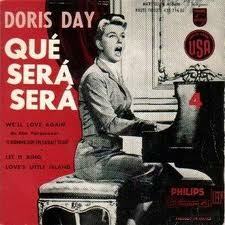 Still another record was released in 1956, one which was a departure for Doris. It was one of the sexiest records she ever made, and fans could hardly believe their ears. The tune "Let it Ring" got lots of airplay because the deejays loved it. The flip side was another great little song called "Love's Little Island". There is more to come. 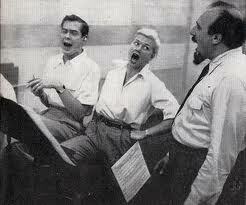 Join us on the next page as we continue this musical journey through the hit record world of Doris Day.